Ever since the release of The Phantom Agony, I had intended to catch a live performance of Epica. With their Raismes Festival appearance clashing with my only opportunity to see Pain of Salvation this year, I resolved instead to see them headline this small festival in Belgium, which also afforded me the opportunity to see some of the finest female-fronted bands on the underground scene right now. The initiative of Philthy and The Metal Organisation in Brussels, it presented seven bands for a mere 15 Euros and given the quality of the fare on offer, it proved to be fantastic value for money. Ten Weyngaert turned out to be some sort of community centre, not too far from the centre of Brussels, with a capacity, I would estimate, of about 500 or 600 people. The hall was packed and the event must have been sold-out or very nearly so. Even though the majority of the audience was Belgian, there were a smattering of English, French and German voices and later in the evening, a large contingent of Dutch fans turned up to cheer the last two bands on the bill. While all bands on the bill shared the distinction of having a female lead vocalist and could all be said to come under the broad banner of Gothic Metal, there were sufficient differences in each band's style to make for a very interesting concert. 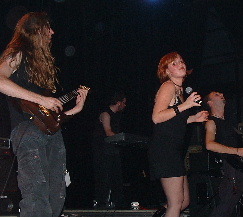 From the more atmospheric Gothic sound of The Last Embrace to the more Pop influenced sound of Sengir, from the darker, heavier sound of Anthemon to the gloriously symphonic sound of Epica, Philthy and his colleagues served up a top-notch bill and scored a first in mounting a festival of this type. First up were Belgian act Keltgar, who I was only able to hear a little of, and even then it was via the inner concrete walls of the venue as I queued at the entrance. Fortunately I had collected my ticket in time to catch the whole of the 30 minute set from Parisian outfit The Last Embrace. I had seen them earlier in the year at a festival in France and I was keen to catch them a second time. 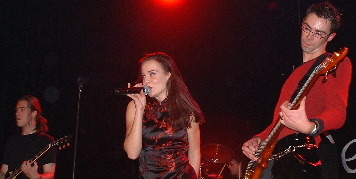 With changeover times trimmed to a minimum, some sound problems were to be expected, but once these were ironed out during the opening number Cold Embrace, the band settled down and vocalist Nathalie's voice revealed its warm, sometimes bluesy charm, particularly during Hear My Call and While you're on Earth - both cuts from the Parisian sextet's debut EP. In the middle of the set, the band slipped in a new composition It Says which hints at a subtle change in the band's sound towards a something slightly more atmospheric, such as that of latter day Anathema. It was a solid performance which confirms that the band is still evolving and promises much for the future. After a Belgian and a French outfit, it was the turn of the Dutch band Morning to take to the stage. 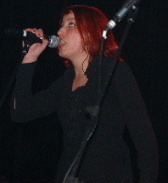 Their performance opened with vocalist Saskia van Heugten singing solo in a style that was a little reminiscent of Tarja of Nightwish, before being joined on stage by her fellow band mates. "We are Morning", she declared, "and we have a problem with our drums". With the collapsing drumkit fixed, they continued with Kill The Silence from their Inside EP, the source of much of the set's material. The band's music had a Gothic/Progressive Metal sound which leans towards Mandylion/Nighttime Birds era Gathering. 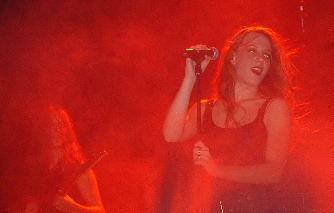 The influnce of Anneke van Giersbergen also shone through in the form and stage movements of Saskia herself. Short in Stature, but extremely animated, she communicated very well with the audience. Her voice perhaps wasn't the best on show on this occasion, but in all other respects, she scored very highly and the band sound very promising. However, the standard of the bands took a step up with the arrival on stage of the French band Anthemon. Despite some equipment difficulties, their set built nicely and by the third song, the crowd was making it very clear that they were impressed too. It was noticeable that the band's keyboards sounded much better than that of the previous bands, perhaps because the band appeared to have brought their own equipment with them and both Longer Than Life and No Rest No Peace, which featured well chosen samples, had a real depth and heaviness. It was also clear that, at the same time, there was much more complexity and progressiveness to their music while the delightful clear vocals of vocalist Nathalie Bonnaud contrasted well with the growls of bassist Marc Canlers. Unfortunately the band ran into some problems mid-set and as a result there appeared to be some disagreements within the band. Rather strangely, they chose to close with an instrumental number, but this did not dissuade me from going straight out and purchasing both of the band's CDs. However, after reading the band's website after the concert, it would appear that Nathalie is leaving and that this was to be one of her last appearances with the band. Such a shame, they were my discovery of the day. Belgian band's Sengir's first CD Guilty Water had not peeked my interest very much beforehand, but this live performance certainly raised my opinion of them several notches. The live environment afforded them a much richer, fuller sound and once the intro tape came to an end and the band was playing Soul's Alive, I knew that I was going to have to reappraise them. Autumn Tears, from the band's demo disk really made me take notice as did the following tune First Lights, while Cry Before the War also sounded very good indeed. The band dedicated the closing song Guilty Water to festival organiser Philthy. Vocalist Ellen Schutyser looked good, sounded good and moved very well on stage. All afternoon the fans had continued to arrive and by the time that Pagan Metallers Autumn had taken to the stage, the hall was very full indeed, with a large contingent of Dutch fans having arrived to support their countrymen (and women) at the top of the Festival bill. Given that it was only possible to photograph the band during the first 3 songs, I chose the wrong time to order some food at the bar and had to eat quickly before fighting my way to the front of the hall. I got fairly close, yet not close enough for the results to be worthwhile including here. As with Sengir, the live occasion also gave them a much heavier, fuller sound and after a few songs I was telling myself that I really needed to revisit their debut album When Lust Evokes a Curse. The Rest of My Days sounded OK, but Mirror Magic Silence definitely brought the crowd to life and from there on the band were on a roll. Harpsichord-like keys introduced Moving Towards Distress with its references to the Arthurian Legend, but the set highlight was probably Who has Seen her wave her Hand which features a flute solo from guitarist Jasper Koenders, as well as some great vocals from vocalist Nienke de Jong. With the crowd now in a great mood she announced "One more song before we have to go, We're going to finish with something sad, sad, sad." Featuring plenty of piano from Menno Terpstra, alternating with passages of chunky riffing, Behind the Walls of her Desire made a very satisfying end to a fine set. Five or six hours had already flown by, but the audience showed no sign of flagging and by the time the organiser Phithy announced the headlining act, it was clear that Epica was the band that the whole of the audience had been waiting for all along. After taking up their places on stage during the overture Adytya, the band members then launched straight into Sensorium, the crowd singing along lustily and leaving them in no doubt that they both knew and loved The Phantom Agony. 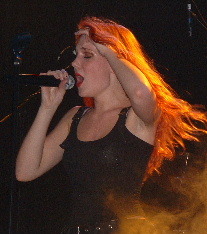 Having thanked the organisers, vocalist Simone Simons introduced Cry For The Moon, after which we heard Run For a Fall, which the crowd really went wild for. With the band only having a single album to their name, it therefore wasn't too surprising that Mark Jansen would want to dip back into the catalogue of his former band After Forever to incorporate the excellent Follow In The Cry. Mark then polled the audience to see how many had bought the album. He must have been pleased with the response as hundreds of arms shot up into the air. He then invited the audience to play a game with him, calling out the first word of the name of a song and inviting the audience to complete the song title. "Inner? ", he cried. "Self!" shot back the audience. Similar games followed as Mark introduced a further couple of tunes later in the set. 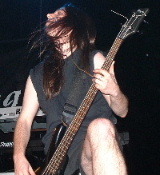 Besides the inclusion of Follow in The Cry, the setlist was also supplemented by the bonus track on the Japanese release of The Phantom Agony, entitled The Triumph of Defeat and composed by keyboard player Coen Janssen. In fact, when they were called back at the end of an excellent set to play an encore they had no uncovered material available. So, Mark having felt that Cry For The Moon had received the best response from the crowd, they played that song again. With the task of headlining such an event above some seasoned acts Epica showed that they can deliver under pressure. 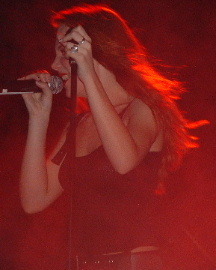 Vocalist Simone Simons looked absolutely gorgeous and was an excellent frontwoman. I couldn't fault her singing, she moved very well and headbanged enthusiastically when she wasn't singing. The rest of the band impressed too. In fact it really was amongst the very best performances from over 100 bands I've seen during 2003. The event appears to have been a huge sucesss, certainly in terms of attendance, but also in terms of the quality of bands on the bill and their performances on the night. Out of a number of Festivals I've attended this year I think this was the most enjoyable musically, because there wasn't a single band I didn't enjoy. All of the performances were very good, the venue was ideal and the organisation was excellent. Epica also dragged the Philthy on stage at the end of the evening and made sure he got a good round of applause from the crowd. He and the Metal Organisation certainly deserved it. I can't wait to see another festival like this one!